Rated 5 out of 5 stars by 23 PRO members. This file has new replacement repaint textures and also includes the original CH-47D Chinook model by Mark Adams & Tom Woods. No other files are necessary. This upgrade contains vast improvements including newly compressed texture files for significantly improved performance and space savings with minimal impact on image quality. All repaints now include actual unit markings and improved olive drab color. Pilots also now have appropriate unit markings. The two Army Chinooks carry unit markings for the 1st Cavalry, 2nd Battalion, 227th Air Regiment - this unit is currently active and provides troop and equipment transport and medivac for the 1st Cavalry - Air Mobile. The Marine Chinooks now carry markings for the 3rd Marine Air Wing. Special thanks to Delizisis Thanasis and Delizisis Panagiots for use of their textures as a painting template. Mike Lanza. "C:\Program Files\Microsoft Games\Flight Simulator X\". Be sure to answer 'Yes to All' for replacing files (you may have to do this twice to replace thumbs.db file - it's OK). If you already have the wonderful Hellenic Army Aviation version, you can just rename, cut & paste the texture folders and edit the aircraft.cfg file accordingly. Despite not always being a massive fan of flying helicopters – due to my propensity for crashing them with stunning accuracy and regularity – I was always looking forward to being able to fly a Chinook helicopter. As one of the most popular names in aviation, this is a helicopter that has performed admirably for decades as a keystone in military aviation all across the world. 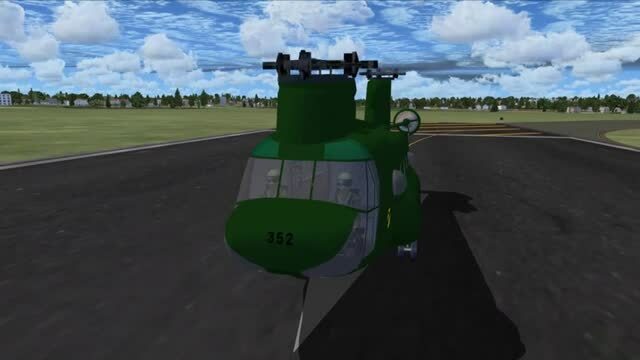 The definition of a solid, durable troop transport the Chinook is one of the most important aircraft around, and being able to fly around in one in FSX was a truly enjoyable experience I’d love to play over again and again. Usually, I’d find that my helicopter skills would take too long to form with any given aircraft and I’d give up in frustration. With this, though, I felt as if I’d been flying it for years! The intentions of each and every button press I made ensured that the aircraft responded how I thought it would. This makes life easier for those who want to fly around in a Chinook but don’t really have the time to learn how to fly helicopters expertly – it seems to be an incredibly forging aircraft to take to the skies in! The excellent quality of the textures used was one of the first things that struck me upon loading up FSX. It all stands out as far more impressive than the usual textures in –game and can really make sure that you have an aircraft that looks just as it should up against its real-life counterpart. Although this was originally just an update for the files released by Mark Adams & Tom Woods the first time around, this includes everything in the one package so if you want to fly HD texture Chinooks that fly as good as they actually look this is well worth checking out. Over 1,000 of these monsters are available in the world at any given time, and this means they are one of the most commonly created modern aircraft. It’s been a big part of military aviation and troop transport for years and has a big history in aviation as a huge part of the development curve that helicopters started to take. It helped to move helicopters away from the rather dainty style they had taken on until then, allowing them to become something a bit more sturdy in term of what they could carry or use. The Chinook is a hugely versatile helicopter and this is part of the reason why I loved it so much; it’s got class and style absolutely pouring out of it! The overall performance of the aircraft is incredibly impressive, and it all fits together nicely in this mod. Nothing is left out or behind to make away for better gimmicks or poor extras; this concentrates on being real and giving Chinook fans the chance to fly something as close to the real thing as you will perhaps be likely to find for a flight simulator like FSX. Great add-on. While the virtual cockpit is a little dated it still flies great. Great job! Very easy to fly and very realistic. Good textures in all views, except virtual cockpit, it doesn't work for me. Also, I think the sound could be a bit more realistic, but except that, I enjoy a lot flying it. I seriously recomend it! Sorry, but Neenjahdude must have a problem with his particular PC - this is a very easy download, and an easy copter to fly - full marks!! The installer appears to be broken, like the virtual cockpit's windows are completely black. The only way for me to pilot the aircraft is with lock spot on the exerior camera. Best and easiest download yet. I don't even like the Chinook but this is such a great quality item that its well worth it. Everything down to the wheels turning when you taxi and the rotor shifting positions when you accelerate! 10 out of 10! For a heavy helicopter I appreciate this download. Easy to install. Different flight characteristics than single rotor. Fun to learn to fly. Good job. I LIKED THIS FILE, BUT I FELT IT NEEDED A LITTLE MORE DETAIL IN THE LOOKS OF IT. THE COCKPIT IS VERY WELL DONE AND THE COPTER IS DIFFERENT FROM ANY OTHERS I HAD. I WOULD PAY ABOUT $6 FOR THIS. Very nice work. I especially like the aged pannel work to make it look authentic. Nice touch. Handles real well too. Easy to download. Back door opens. Very stable and easy to fly. Just a tough as the real thing. Downloading this heavy bird is a must! Air Moble! This is by far the best downlaod I have downloaded. I enjoy flying the more than any other helicopters in the game.